Create QR codes, customize Google Maps, and eliminate inefficiencies with these extensions. Google Sheets is one of the most versatile business and productivity tools. But no matter how sharp your cell skills are, you can always use an assist. 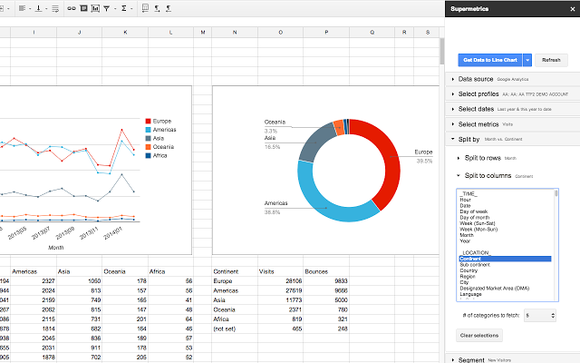 Whether you’re looking for a better way to maintain, present, or repurpose your data, these Google Sheets add-ons will supercharge your spreadsheets. Spreadsheets are valuable tools, but they’re not incredibly efficient. Unless they’re constructed perfectly from the outset—and how often does that happen?—you’ll likely spend hours manually fixing bad formulas, duplicate data, and formatting issues. And the bigger the spreadsheet gets, the harder it will be to maintain. PowerTools is an all-in-one add-on for all your spreadsheet cleanup and maintenance needs. 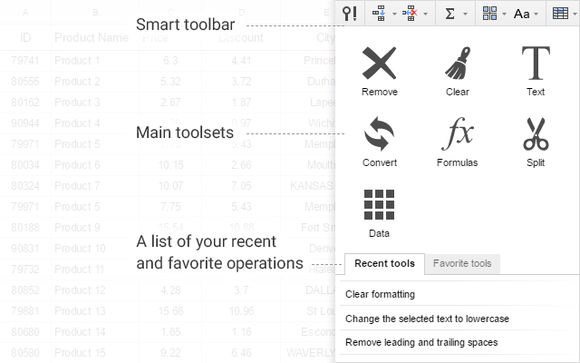 Power Tools eliminates the tedium of cleaning up a spreadsheet. It combines several AbleBits tools such as Merge Values, Remove Duplicates, and Find Fuzzy Matches into an all-in-one add-on. With Power Tools, inserting cells and shifting data, AutoSum-ing rows of numbers, and freezing/unfreezing columns become single-click actions. There are tool sets for converting data formats, cleaning up dupes, working with text, and more. And Power Tools keeps a history of your actions so you can quickly reapply them to another range of cells. Business analytics require pooling from a variety of data sources, including social media, ad services, databases, and more. Accessing that data is easier than ever, but getting it into a spreadsheet is not. Supermetrics offers a powerful solution. Supermetrics makes it easy to import data from popular sites and services. It connects with many popular sites and services—Google Analytics, Bing Ads, Facebook, LinkedIn, and SEMRush, to name a few—as well as your own databases. To import data, you select a connection and create a query, apply filters to find specific stats, and define the fields you want added to your spreadsheet. Supermetrics will pull in the information and automatically refresh the sheet daily. Then you can share data reports from your spreadsheet via Google’s sharing options or schedule automatic emailing in PDF, Excel, CSV, or HMTL formats. Whether you want to track customer locations or just visually display your friend’s addresses, plotting your data on a map can be incredibly helpful. Mapping Sheets lets you to create custom Google Maps directly from your spreadsheet data. 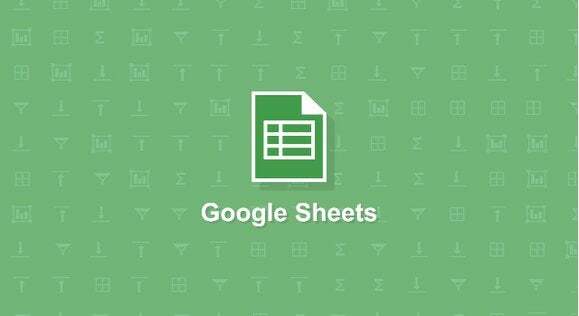 Mapping Sheets lets you plot data from your spreadsheet on a Google Map. Once you download the add-on, enter data such as company names, their categories, addresses, and other info into a spreadsheet page. Then click Add-ons > Mapping Sheets > Start mapping. You can drill down the data on your new map using the radius, category, and search filters on the sidebar menu. And clicking a marker icon will display all the details of that location. The global nature of business sometimes requires working with documents in non-native languages. 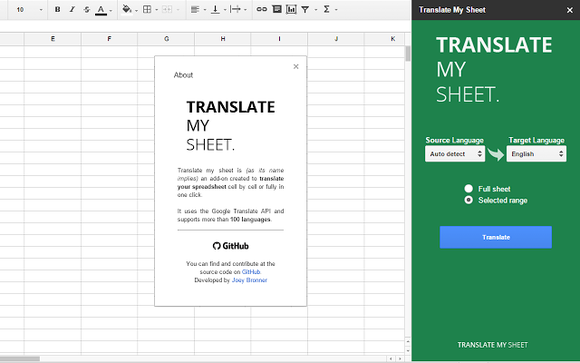 While Google Sheets has a built-in function for translating individual cells—=GOOGLETRANSLATE()—converting larger amounts of data with this method is time consuming. Translate My Sheet can translate a range of cells or an entire spreadsheet in seconds. Translate My Sheet, however, can translate a selected range of cells or your entire sheet almost instantaneously. Install the add-on and either manually select or have it auto detect the source language. Then select the target language from more than 100 options and watch it translate in seconds. The humble QR code is now used to share everything from product information to Wi-Fi access to business cards. 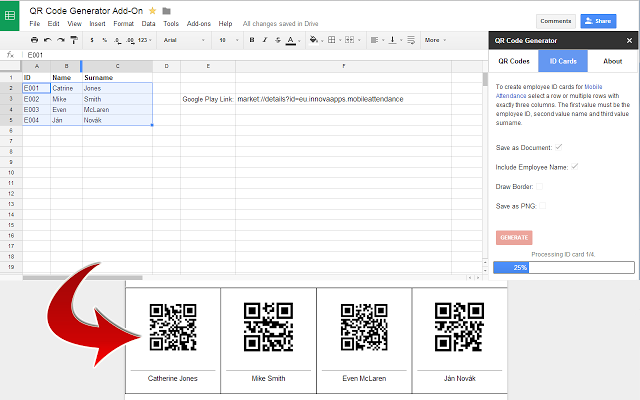 The QR Code Generator add-on lets you create your own from values in Google Sheets. Create QR codes from your Sheets data with QR Code Generator. After you install the add-on, go to Add-ons > QR Code Generator > Start. Select the cells containing the data you want to encode, then select a file type—Google Document or PNG file—and other preferences by checking the appropriate boxes in the QR Code Generator sidebar. Then click Generate and your new QR code will be saved to Google Drive.